Hi everyone!! I wanted to take the time to thank ALL of my readers/followers for joining me here at my blog during 2013!! I hope that I have brought you some inspiration, and a smile to your face with some of my creations!! 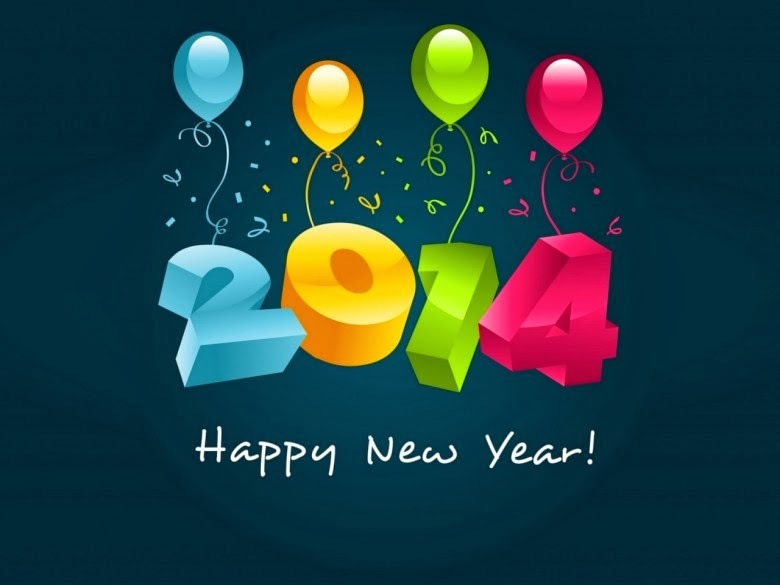 I hope to bring you more happiness and joy with my cards, and projects in 2014. A new year is upon us, and that means new beginnings and change - so I hope to bring some new ideas, and some exciting things to my blog, You Tube Channel, and other social media in the new year!! Happy Monday :) We are just days away from Christmas! Hard to believe, but I welcome it!! I wanted to share with you this card I made over a couple of weekends ago. I wanted to use some of my favorite patterned papers from this season from Crate Paper - Bundled Up. These colors are no traditional but that is why I love it so much - fun and different!! I just love these papers!! 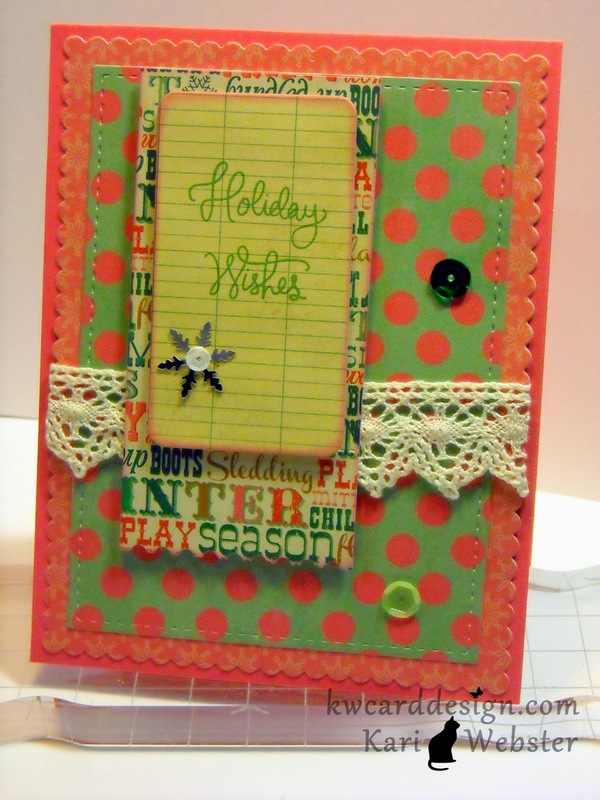 I used my favorite dies - the Femme Frames from Mama Elephant yet again ( yes - I am obsessed) and also used the Wrapped Mailing Label Die from Simon Says Stamp for my middle panel on my card. 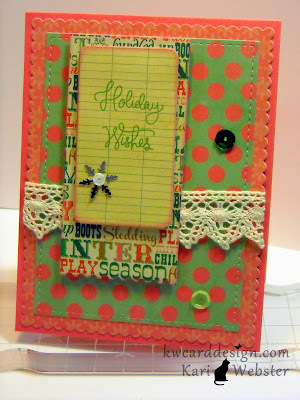 With a mixture of small embellies, and crocheted ribbon this makes for a fun over Holiday card. Well Hello ! Welcome back to another and the *final* challenge for 2013 for Lawnscaping! WOW - hard to believe, right!! Well, we are going out with a bang to really challenge you! We have a color combo for you to get your juices flowing! I used Here's the Scoop - I think this set is such a cute one, but I don't use it as much as I would like to. 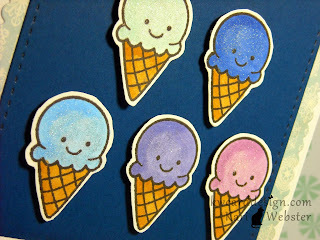 I stamped and colored five ice cream cones and I colored them using my Copic Markers. I die cut my favorite and go to A-2 frames Femme Frames by Mama Elephant from Navy card stock and some patterned paper. I fussy cut my ice cream cones and then adhered them with some foam adhesive for dimension to my Navy card stock panel, and then adhered that to my patterned paper frame. I then stamped my sentiment onto some white card stock from the same stamp set and cut it down to a banner shape, and also adhered that with foam adhesive. 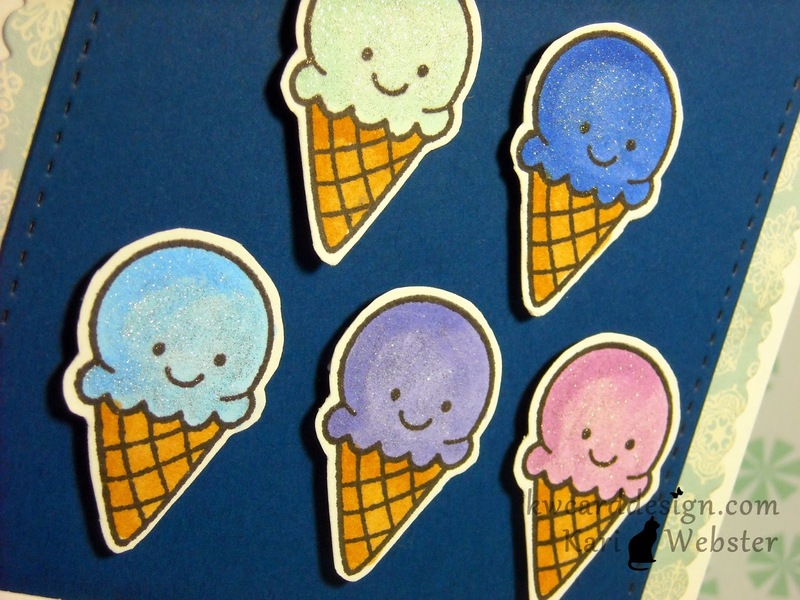 To finish off my card - I thought the ice cream cones screamed "give me shimmer" so I added some shimmer with my Wink of Stella pen. 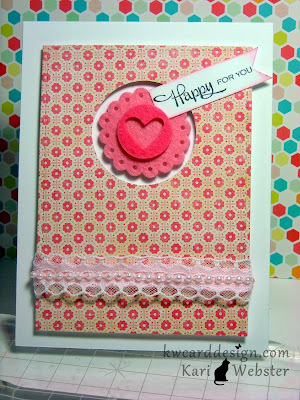 Baby Blog Hop for Elise! Congrats! 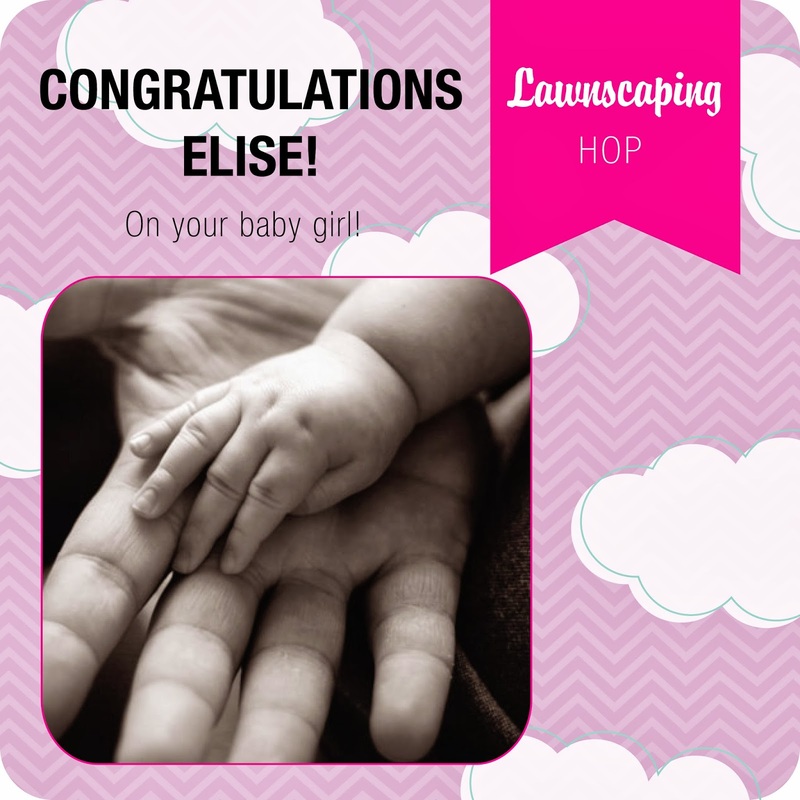 A few of us crafty friends wanted to surprise Elise with a blog hop to congratulate her on her new bundle of joy!! You should have found your way to me by the way of the sweet and talented Lenny!! 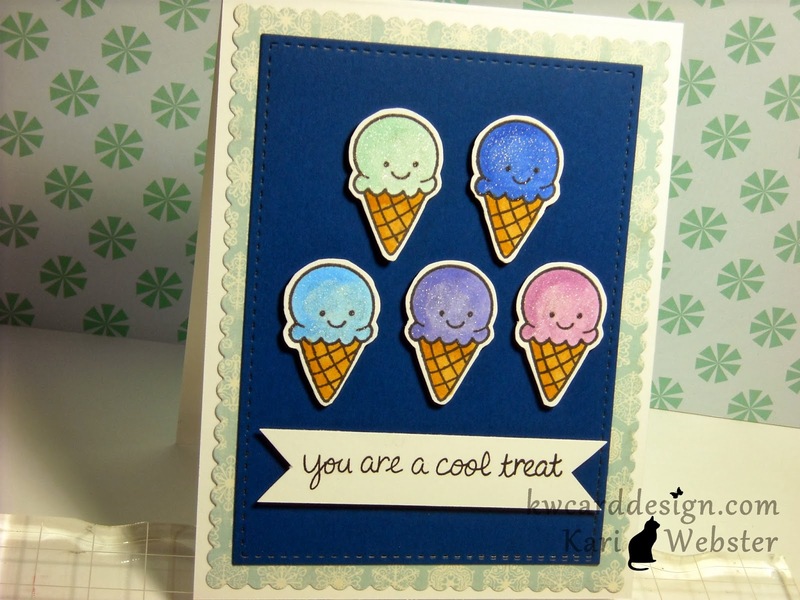 Here is the card I made to mark this joyful occasion! Elise - I hope you like it! I know you are just over the moon! I couldn't be more happy for you!! I wish you and your family nothing but happiness with your new addition!! May she bring joy and love to your hearts everyday!! Now its time for me to send you off to the awesome Samantha M.
Hello, Hello!! 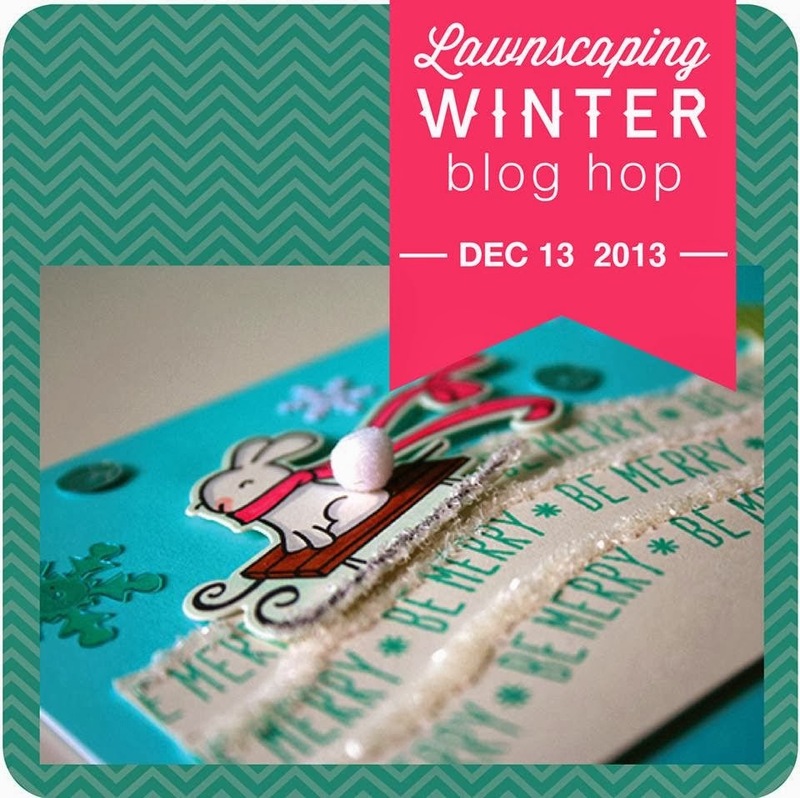 Welcome to the Lawnscaping Winter Blog Hop!! You should have come my way by the talented Nancy Thomas. 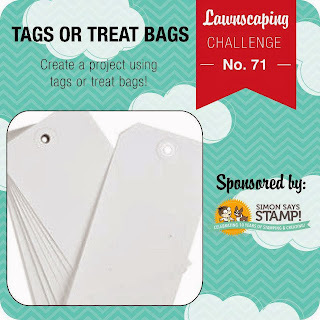 If you have gotten lost along the way, never fear you can head back to the Lawnscaping Blog to find you way back on track. I'm so tickled you are visiting me today along this fun event from Lawnscaping! 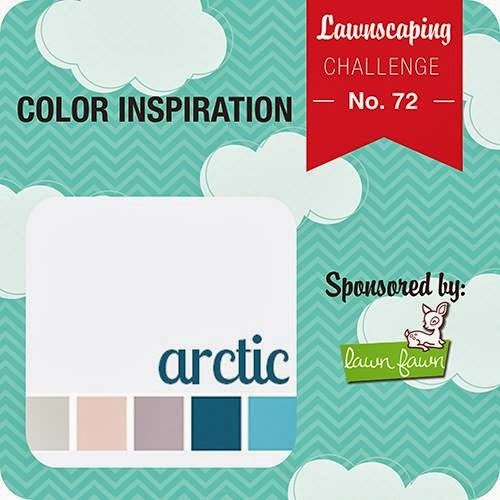 I'm am especially honored and proud to be apart of this being a member of the Lawnscaping Facebook Inspiration Team. There are a ton of talent along your journey, so be sure to visit each and every person! There will be lots of inspiration, and not to mention prizes and giveaways! 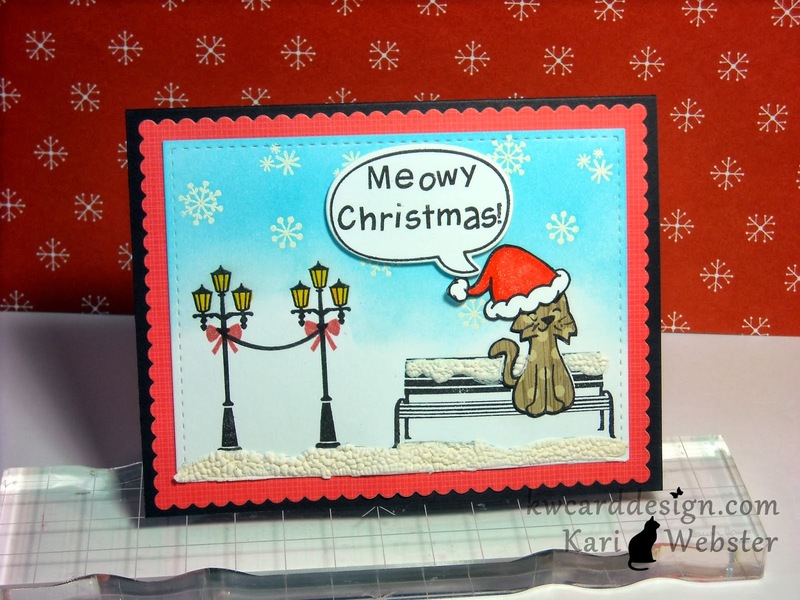 "Meow-y Christimas" :) Since I am a cat lover and a fur baby mama to two cats, Katie and Daisy - this was fitting for me to create ! I used 5 different LF stamp sets for this card! Winter in the Park, A Birdie Told Me, Harold's ABC's, Hats off to you, and Critters in the Burbs. I used my favorite dies for my cards - the Femme Frames from Mama Elephant, and I started by stamping on the smaller panel the light posts, and the park bench. I actually did some masking, but after I paper pieced my kitty, I realized I really didn't need to. No biggie! I stamped out some snowflakes from the Winter in the Park set and white embossed it, and then added some Tumbled Glass Distress ink to bring out the snow flakes. One of my favorite techniques is emboss resist! 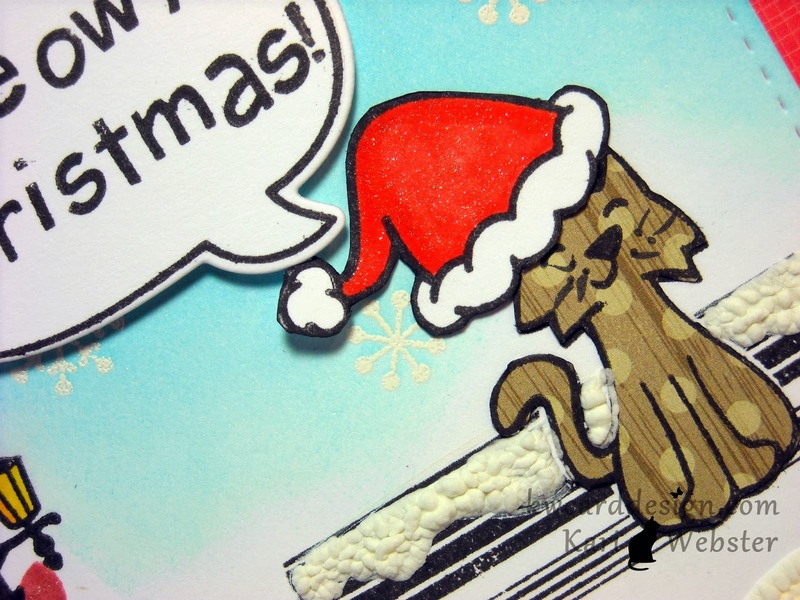 Then, I started working on paper piecing my kitty cat, and the Santa hat. By this point, my kitty is pretty festive!! I started working on my sentiment, which is as you see is a customized sentiment. I stamped and die cut one of the speech bubbles from A Birdie Told me, and used Harold's ABC's and stamped out my sentiment - "Meow-y Christmas!". I added some Liquid Applique to the park bench and ground to add extra texture and fun. I also added some Wink of Stella to the bows on the lights, and kitty's hat. I die cut the largest scalloped frame from Femme Frames from some pattern paper from the Peace, Joy, Love 6x6 pad, and then adhered my panel to the patterned paper, and then adhered that to my black stock card base. Hi all!! I've been experimenting! Experimenting with different embossing pastes - and I have a new love!! This stuff is so addicting! Instant gratification! I am also doing something that I haven't done in a while! Playing in challenge! I haven't actually been a participant in a while of a challenge. 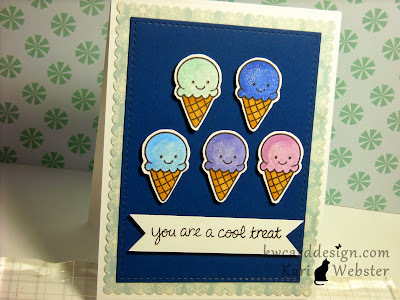 Lately, I have had only enough time to complete DT projects - but today I am making the time to enter to the Simon Says Stamp Wednesday Challenge - make your own background. I haven't participated in this challenge before, so it is something fun and different for me. I started out by taking a 4.25 x 5.5 inch piece of Marshmallow card stock, and used Tumbled Glass, Chipped Sapphire, and Dusty Concord Distress Inks, and created by "Night Sky". Then, I have a Studio Calico Mask with Stars and used it with Silver Ferro embossing paste. This stuff is AHHmazing!! The texture is awesome once it is dry. Once it was dry - I then took one of my Lawn Fawn Star Stackables and die cut through my panel, and then I backed it with another piece of Marshmallow Card stock and then I adhered it to a black card base. 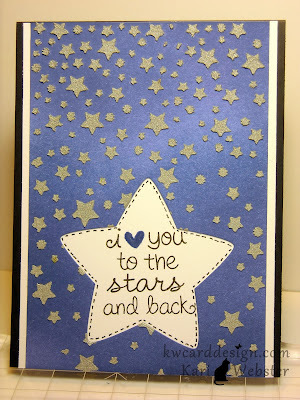 I stamped my sentiment from the Lawn Fawn Lucky Stars stamp set. 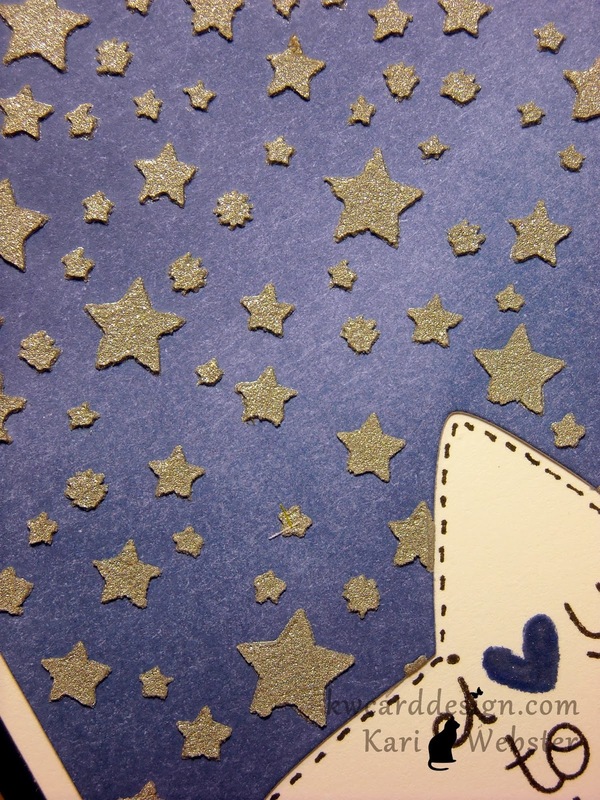 To finish it off I added some faux stitching to bring out the star on the white card stock. It's my birthday!! Be Merry and Bright! I wanted to pop in today quickly and share with you one of the cards I had the chance to create this weekend during the long Thanksgiving holiday! Today is my birthday - I am ....thirty - flooaghoahd - HAHA! Seriously - I am turning 37 today! WOW! Where DOES the time go?? I've been blessed with numerous happy birthday wishes and love from my family and friends. I feel blessed! 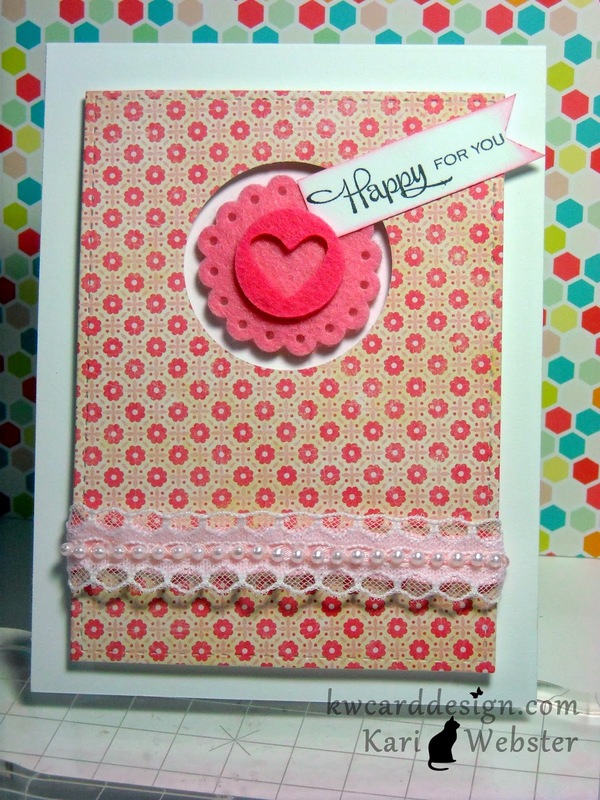 I am really liking this trend where you create "wonky" panels on cards - its different and fun! So - I wanted to make my own creation this way. I took some pattern papers from the "Bundle Up" Collection from Crate Paper - LOVE this paper!! I die cut it from the scallop frame from Mama Elephant - Femme Frames - again - I'm obsessed!! I adhered my die cut panel to some Simon Says Stamp Wood grain card stock which is my base. I die cut a banner from the small banners die also from Simon Says Stamp, and I stamped and heat embossed " & Bright" from the Merry and Bright greeting that comes in the Small Folded Banners Holiday stamp set from SSS. I love the wood elements that SSS came out with last year and I had some left over, so I used the "Merry" to complete my sentiment. 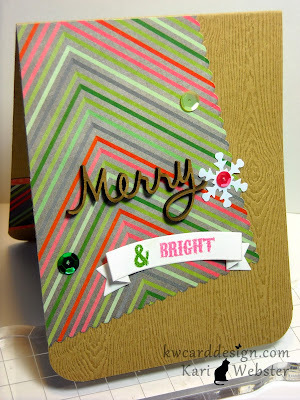 To finish off my card, I just added some fun sequin embellishments from Lawn Fawn. 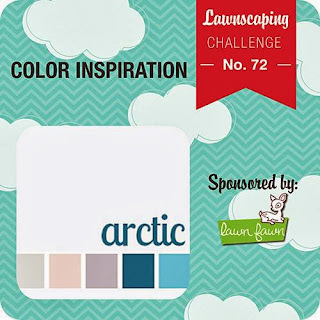 Welcome back to yet another Lawnscaping Challenge. We only have two challenges left in the year 2013!! That is craziness! Since everyone is gearing up for the holiday season - which by the way is craziness too!! - we are focusing on those tags or treat bags you will be using this holiday season!! 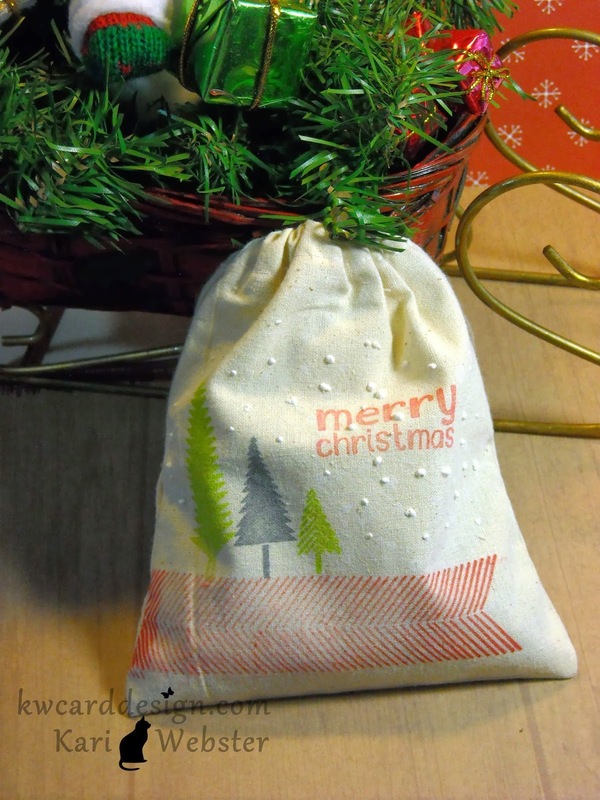 Here is my bag that I created. I started out with a plain canvas bag. I wanted to "doll up" up my canvas bag - so I decided to stamp on it. This is a lot of fun if you have never done this. 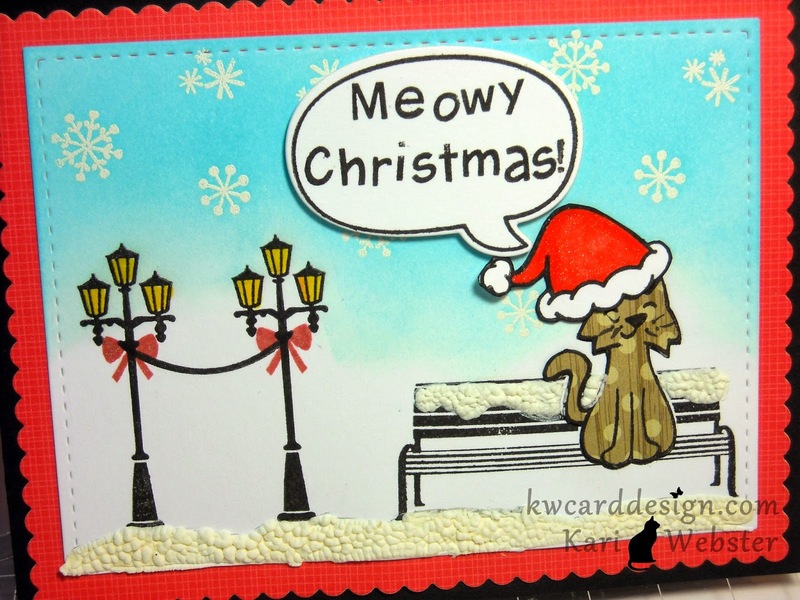 I chose two stamp sets - Let it Snow and Interlocking Backdrops. I used all pigment inks - Colorbox Cranberry, Memento Luxe Pear Tart, and Hero Arts Silver. I stamped first the chevron pattern in the Cranberry ink, and then I stamped the trees in Pear Tart and Silver inks. Then, I stamped my sentiment from the Let it snow set in the Cranberry ink. 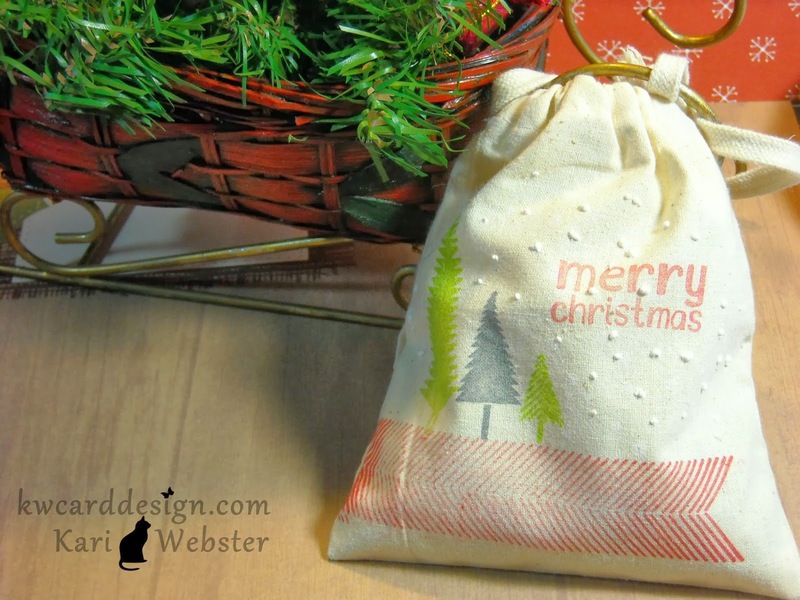 I wanted some "snow" so I took my Liquid Applique in white and dotted on randomly on the bag, and then heat set it to make it puff up a little. And, that's it! Super easy, super fast!! These bags are fun to stamp on!